The Face of Love addresses the important issue of grieving over the loss of a spouse, but it would perhaps be better suited to the stage than screen. This heavy-handed drama, directed and co-written by Arie Posin, insists on freighting every line, every location, every prop with meaning. 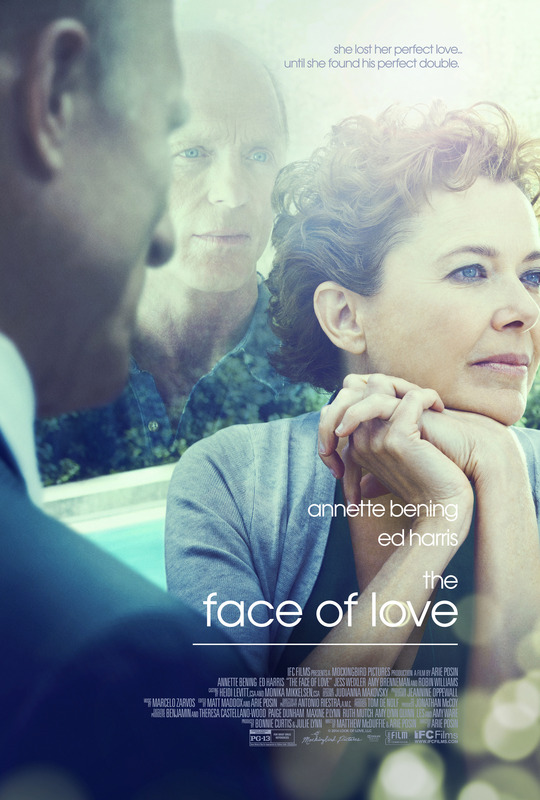 The effect actually works well in the opening sequence, where Nikki (Annette Bening) recalls how her husband Garrett (Ed Harris) died by drowning in Mexico on the couple’s 30th wedding anniversary. The pain she experiences—emphasized by her cutting her hand on a broken wine glass—is palpable. Nikki is triggered by every little detail in the couple’s super stylish house, which Garrett built for her. She is uninterested in the lap pool, but lets her widowed neighbor Roger (Robin Williams) use it. Five years after Garrett’s death, Nikki still winces at a phone call for him. So it is to her incredible surprise that Nikki spies Tom Young (Harris) at LACMA one afternoon—especially since she has gone to the museum to rekindle memories of her late husband. Note how the ticket agent asks her about coming to visit [an exhibit] on the past. Unsubtle, it ain’t. Nikki is bemused at seeing Tom, but she quickly becomes obsessed. She returns to the museum again and again waiting for him to reappear, and when he does, she follows him. She discovers he teaches art at Occidental College, and tries to take one of his classes. Her breakdown at talking with his man who looks so much like her husband is one of the few honest moments in The Face of Love. Too much of Posin’s film hinges on Nikki withholding this BIG SECRET from Tom, not that Tom isn’t keeping some critical information from Nikki. A phone call he has with his ex-wife (Amy Brenneman) clues the audience in on his situation. Therefore, it is only a matter of time before somehow, someone—Roger? Nikki’s daughter (Jess Weixler)? The sushi chef at Nikki’s favorite restaurant?—spills the beans about Tom’s eerily uncanny resemblance to his new love’s late husband. And it is to the film’s discredit that this dramatic arc of secrets and lies overwhelms the more important story of how widows and widowers should grieve, and find new love. There is something worthwhile in how Nikki and Roger process life without their late spouses that is underexplored here, as well as how Tom and Nikki talk about aging and looking back on their lives. Instead Posin and his co-writer Matthew McDuffie have Tom say howlingly bad lines like, “I could take a bath in how you look at me.” Nikki is also not spared silliness; in addition to going to great lengths to hide the past she is trying to recapture from Tom, she goes Vertigo on him, dressing her new lover up in the seersucker jacket Garrett wore on their last night together. The Face of Love wastes its talented leads, too. Bening makes the initially sympathetic Nikki quite unlikeable within the first reel. While she has some nice moments that show her character’s anxiety, her performance is more offputting than engaging. Harris is not given much to play, since Tom is largely Nikki’s puppet. The characters here may seek catharsis, but audiences won’t find any. The Face of Love opens today in Philly area theaters. Gary M. Kramer is a Philadelphia-based freelance writer. He is the co-editor of Directory of World Cinema: Argentina. Volumes 1 and 2, and teaches seminars at the Bryn Mawr Film Institute. Follow him on Twitter @garymkramer.